Before we go into the different strategies banks are implementing and who those banks are, let’s clarify a bit between Financial Technology and Banks. A bank is a financial institution that can receive deposits, make loans, manage wealth, exchange currency, and of course, store your money. What is an example of a “fintech” player then? Venmo, a mobile payment service owned by Paypal, allows users to send and receive money. If you link your Venmo account to your checkings account, it’s completely free, and if you pay through credit, it’s an additional 3% fee (most people use the checking to checking option). Also, something neat about Venmo is that the money you get sent is stored in the app before you “cash it out” to transfer it back into your bank account. Venmo started in 2009 and dominated – it was convenient, secure, and fun because of the social aspect to include messages that all your friends can see what the payment is about. Following the same timeline two years later, banks finally realized that people didn’t write checks anymore and people needed a quick and easy way to transfer money to each other. In 2011, Bank of America, Chase, and Wells Fargo launched clearXchange, “a US-based digital payments network that enables US individuals and businesses to electronically transfer money directly from an existing bank account to another person’s existing bank account using a web interface or mobile device.” These banks started also to build apps that enabled digital banking and let you deposit checks and make payments through your mobile app. In 2009 just five months after Venmo publicly launched, Braintree acquired them for $26.2 million. In 2013, Venmo alone processed $521 million dollars in transactions, and in 2015 Venmo processed $7.5 billion dollars. That is exponential growth. 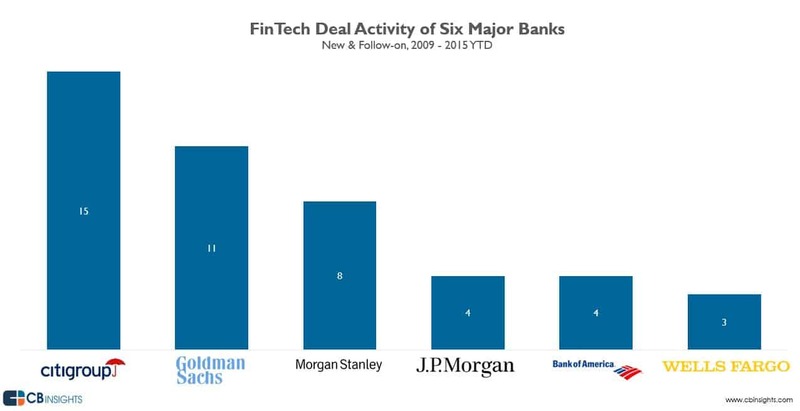 In the meantime, banks play catch up with Chase QuickPay, BoA online transfer, and Wells Fargo SurePay. Alex makes an interesting point how Fintech focuses on the customer’s experience. Think about the popular Fintech companies doing well over the years – Betterment, Square, Acorn, SoFi, and many others. Betterment – A robo-advising service where you can select types of plans or investing styles for it to automatically invest your money. This edges out traditional asset managers where there are higher fees, less autonomy, and risk prone to human error. SoFi – Borrowing money can be hard because there is an approval process or the interest rates may turn potential customers away. Well, now there is a marketplace for that! People can invest in risky loans for higher interest rates, and those who need money gets it for whatever reason they needed it for, win win! Square – Take payments stress-free with Square. Swipe a credit card in a reader and you’re done. It has very straightforward implementations into bookkeeping applications and setting up a traditional point of sales system can be painful especially for small business owners. With these three examples and industries, it shows a clear theme – customer experience and the demand for better financial products and services. Many traditional financial industries are getting disrupted because other fintech companies provide users benefits such as ease of use, reduced complexity, and instant access. It’s difficult for banks to become small and agile, so of course, they come prepared. 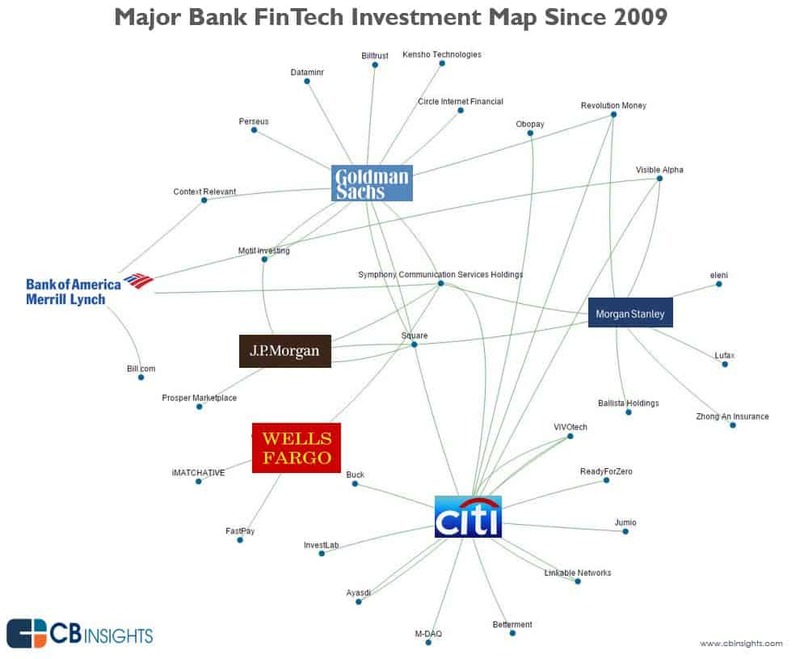 Banks are also overlapping investments in fintech companies. Goldman Sachs has their own fintech company, Symphony (a Bloomberg terminal competitor), invested in Square and many others. Wells Fargo has its own accelerator in SF to develop innovative technologies, and banks with consumer banking like Bank of America and J.P. Morgan partners with Apple for Apple Pay. 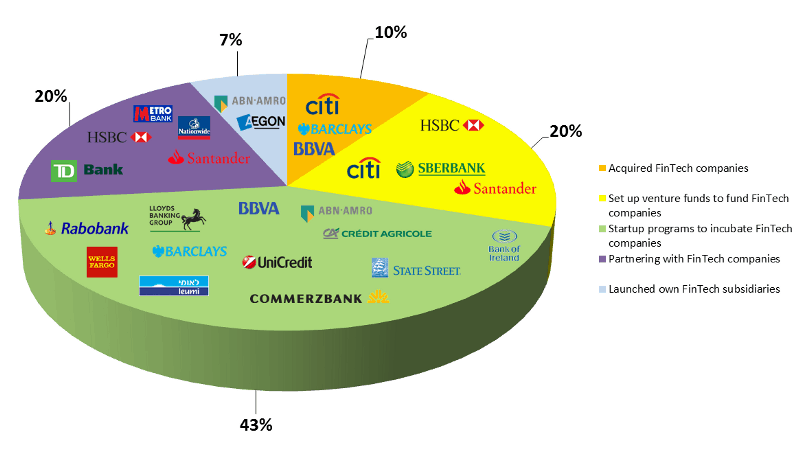 Can Fintech win over banks? Well, the bank’s size, power, and influence are gigantic since they’ve been around longer and are more established, so not yet. However, we see that the sense of urgency to transform is there with banks. The idea of banks began since 1800 BC in Babylon and didn’t really start to develop until the 12th and 13th century. It’s an industry that’s long due for disruption and with the help of Fintech companies, banks can leverage APIs to integrate with Fintech products or services to continue their dominance and relevance. IT spend in banks are rapidly increasing to invest in digital banking and after they have a firm foundation, banks no longer need to fear Fintech companies but become the enabler for innovations to come. You can thank the banks next time you forget your credit card and pay with Apple Pay.